I always love to see what becomes of the things I make and sell. In this case, I sold a single skein of handspun yarn to a lovely repeat customer who has an Etsy shop. As it turns out, this customer was in town visiting when she made the purchase so in order to save on shipping we agreed to meet at a predetermined location. After I handed her the yarn we talked in the parking lot for 30 minutes in the somewhat (no actually really, really) cold weather. 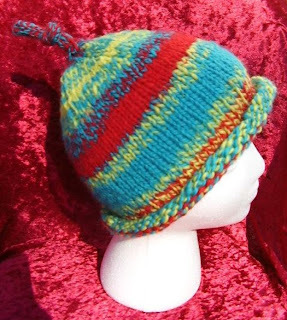 The skein of yarn she purchased was only 102 yards but she still made this lovely adult sized hat. A great example of what you can make with a single skein of handspun. (Bulky yarn requires even less yardage.) So please, pop on over to Mountain Eagle Crafter's etsy shop today.